The Lost Colony is an historical outdoor drama, written by American Paul Green and produced since 1937 in Manteo, North Carolina. It is based on accounts of Sir Walter Raleigh's attempts in the 16th century to establish a permanent settlement on Roanoke Island, then part of the Colony of Virginia. The play has been performed in an outdoor amphitheater located on the site of the original Roanoke Colony in the Outer Banks. More than four million people have seen it since 1937. It received a special Tony Honors for Excellence in Theatre award in 2013. The play was written during the Great Depression by Paul Green, who had earlier won the Pulitzer Prize for drama. The Lost Colony marked a shift in his work from more traditional forms of drama to focus on the creation of large-scale outdoor musical spectacles which he termed "Symphonic Dramas." As of 2012, this is the United States' second longest-running historical outdoor drama, behind The Ramona Pageant produced in Southern California. Before Jamestown and Plymouth were founded, a group of about 120 men, women and children established one of the first English settlements in the New World on Roanoke Island in 1587. Shortly after arriving in this New World, colonist Eleanor Dare, daughter of Governor John White of the colony, gave birth to her daughter Virginia Dare. The governor's granddaughter was believed to be the first English child born in North America. Life on the island was difficult for the colonists. Low on supplies and facing retaliation from the Native Americans they had displaced, the colonists sent Governor White to England in the summer of 1587 for supplies. Because of the impending war with Spain, White was unable to return to Roanoke Island until 1590. When he arrived, he found no evidence of the colony. 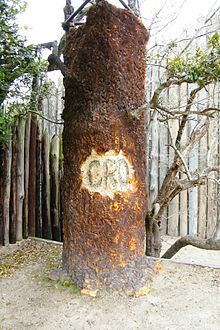 People believe the word "CROATOAN" was carved on a post. While some theories hold that the colonists died at the site, the fate of those first colonists remains a matter of scholarly debate. On July 4, 1937, The Lost Colony first opened. Annual celebrations of Virginia Dare's birthday, August 18, had been celebrated by the Roanoke Colony Memorial Association since its founding in 1894. The early events were primarily picnic meetings, featuring hymn singing and commemorative speeches. In 1923, the festivities were expanded to include dramatic sketches. By 1925 local residents performed a full-scale pageant of the story, using pantomime, music, and narration. W. O. Sounders, editor of the Elizabeth City Independent, was a passionate supporter of the pageant and supported expanding the celebration. Mabel Evans Jones, Roanoke Island native and Dare County School Superintendent, wrote, produced and starred in a 1921 silent film of the historic events. The film was shown across North Carolina. It was the first silent film produced in the state. The 1926 pageant attracted the largest crowd to that point, and organizers sought to build on their achievement. They began to prepare to mark the 350th anniversary of Virginia Dare's birth. They approached North Carolina playwright Paul Green about developing a new pageant script. Having visited the island on several occasions, Green had already considered writing a piece about "those tragic first settlers." He joined with Saunders and Bradford Fearing, president of the Roanoke Historical Society, to develop a play to celebrate the 350th anniversary of Virginia Dare's birth. Initially, the team imagined a plot to tell the legend of Virginia Dare's falling in love with Chief Manteo's son and giving birth to a new race that has since vanished. To raise interest in the pageant, they planned to conduct a nationwide beauty contest to find a young woman to play Virginia Dare. But Green envisioned a spectacle with a combination of music, dialogue, and dance, which he called "symphonic drama". He wanted the drama to express community ideals of freedom, struggle, and perseverance—guiding themes for a nation in the grips of the Great Depression. The original production had difficulty finding funding; early pledges of support evaporated as the depression deepened. The Works Progress Administration (WPA) of President Franklin D. Roosevelt helped provide funding and labor for the production through its various agencies; it supported theater groups, writers and artists among the people put to work during the Great Depression. North Carolina Congressman Lindsay Warren secured the production of 25,000 memorial half dollars to be sold to raise funds. English-born architect Albert Quentin "Skipper" Bell began construction of the large-scale set with assistance from workers of the Civilian Conservation Corps (CCC). Previously, Bell had designed a village of log-structures on the grounds of Fort Raleigh. Through the Federal Theatre Project, WPA funds were used for salaries as part of a Theatre Works initiative to assist out-of-work Broadway actors from New York City. English-born actress Katherine Cale starred as Eleanor Dare, Virginia's mother, while Lillian Ashton portrayed Queen Elizabeth I, Earl Mayo played the comic Old Tom, and Jack Lee narrated the production as The Historian. Other actors were hired to fill the major roles, with members of the Carolina Playmakers, Roanoke Islanders, and CCC taking the smaller roles. The production was directed by Samuel Selden, one of Green's associates in the UNC Playmakers of Chapel Hill, under the supervision of Frederick H. Koch. President Franklin D. Roosevelt saw the production on August 18, 1937. He said, "We do not know the fate of Virginia Dare or the First Colony. We do know, however, that the story of America is largely a record of that spirit of adventure." The drama attracted enough tourists to stimulate the economy of Roanoke Island and the Outer Banks of North Carolina. Their hotels, motels and restaurants thrived despite the bleak depression economy. The village of Manteo renamed its streets after historic figures in the drama. Originally intended for one season, the drama was produced again the following year and has since become a North Carolina tradition. Since 1937, more than four million visitors have seen it. Of more than 40 outdoor dramas that have been produced through the 20th century, it is one of three that in the early 21st century continues. The drama has been a community effort, and many local Roanoke Islanders and North Carolinians have performed in it. Marjalene Thomas first performed with the show in 1938 and throughout the years played every female role — with the exception of one. Robert Midgette (fight director of The Lost Colony) has been with the show 38 years. Actor Andy Griffith, who performed at the production's Waterside Theatre on Roanoke Island from 1947 to 1953, liked Manteo so much he decided to live there permanently. North Carolina State Senator Marc Basnight was born in Manteo; he performed in the role of a colonist child in the play. Actors Leon Rippy, Chris Elliott, Eileen Fulton, Terrence Mann, Ira David Wood III and R.G. Armstrong got their stage legs at the Waterside Theatre. Ted Tally spent a summer in the production long before winning top Academy Award honors for his screenplay of Silence of the Lambs. His niece appeared in the 2008 production. The current artistic team has members who started their careers with The Lost Colony. This includes Production Designer William Ivey Long, winner of six Tony Awards for Best Costume Design. The drama is performed nightly May–August at 7:45 pm, Monday-Saturday. The waterside theatre on Roanoke Island where the play is performed. On September 11, 2007 a resident of Nags Head, North Carolina reported a fire across the sound. All fire departments north of Oregon Inlet responded to find part of the Waterside Theatre in flames. The fire crews worked to control the blaze. In spite of their efforts, the maintenance shed, Costume Shop, and a small storage building were completely destroyed. No cause has been determined. Except for a few costumes stored at the dry cleaners and others on display at the North Carolina Museum of History in Raleigh, the production's costumes suffered a total loss. The destroyed costumes include vintage costumes created by Irene Rains in the 1940s and 1950s; all of Fred Voelpel's costumes made in the 1960s, 1970s and early 1980s, and the later costumes designed by Tony award-winner William Ivey Long. Recovery from the 2007 event relied on assistance from federal, state, and local sources in additions to donations from individuals and foundations. The costumes were replaced and the building was rebuilt for opening night on May 30, 2008. ^ Green, Paul and Laurence G. Avery (2001). The Lost Colony: A Symphonic Drama of American History. Chapel Hill: University Press of North Carolina. ISBN 978-0-8078-4970-5. ^ "Tony Awards winners list". The Lost Colony. USA Today. June 10, 2013. Retrieved 22 May 2015. ^ McElroy, Steven (May 16, 2013). "Theater". The Lost Colony. New York Times. Retrieved 22 May 2015. ^ Anker, Erica. "Tony Honor: The Lost Colony". Tonyawards.com. Retrieved 22 May 2015. ^ Powell, William S. (1985). Paradise Preserved: A History of the Roanoke Island Historical Association. Chapel Hill: North Carolina University Press. ISBN 978-0-8078-0975-4. ^ a b Downing, Sarah (2013). Hidden History of the Outer Banks. Charleston, SC: The History Press. pp. 41–43. ISBN 978-1-60949-914-3. ^ Towler, Teuta Shabani (1 February 2012). "Silent Film Started a Long Tradition". The Outer Banks Voice. Retrieved 26 February 2014. ^ a b Green, Paul (1994). A Southern Life: Letters of Paul Green 1916-1981. University of North Carolina Press. p. 302. ISBN 0-8078-2105-5. ^ Thibodeau, Ryan. "The Lost Colony". Carolina Designs. Carolina Designs Realty, Inc. Retrieved 25 July 2017. ^ Green, Paul (1946). "Preface" 'The Lost Colony'. Chapel Hill, NC. p. xiii. ^ 'The Lost Colony' Souvenir Program. Chapel Hill, NC. 1937. ^ "Early Music in the Play" 'The Lost Colony' Souvenir Program. Chapel Hill, NC. 1937. ^ Brickhouse, Anna (2015). The Unsettlement of America: Translation, Interpretation, and the Story of Don Luis de Velasco, 1560-1945. New York: Oxford University Press. p. 245. ISBN 9780199875597. This page was last edited on 27 December 2018, at 16:55 (UTC).